You can participate in this ministry by partnering with us in prayer, because this is a spiritual endeavor, and by partnering with us financially. Thank you for your participation in this Gospel ministry. • 100% commitment of our monthly budget. The chart below shows our estimated current support status (as of March 17, 2019). Our Monthly Supporter Team provides for the following: Language Training, Living Expenses, Vehicle Expenses, Medical Expenses, Clothing, Ministry Expenses, Furlough Savings, and more. One-time Gifts provide for the following: Shipping Container, Plane Tickets to France & Madagascar, a 4×4 Vehicle, and four months of monthly support in our account (required by our mission agency as a safety reserve). Make a one-time or recurring credit card donation by filling out the form at the bottom of our GMI web page. Type in an amount to give, select either “One Time” or “Monthly”, then click the “+ Add to Giving” button, then on the next screen you can either create a new account or sign-in with your existing gracechurch.org account. Enter your credit card billing information, then click the “Submit Payment” button. Thank you! To set up a monthly direct deposit, print this form and follow its instructions (Use missionary/project “Ellingson – Madagascar, #080507“). GMI Direct Deposit benefits you because there is no check writing, no postage costs, easy to track donations, and it’s easy to start, change, or stop. This method benefits us as missionaries because donations do not get delayed, lost in the mail, or accidentally forgotten. Since credit cards expire, donations can stop unexpectedly. But direct deposits stabilize our support and allow us to stay focused on ministry. 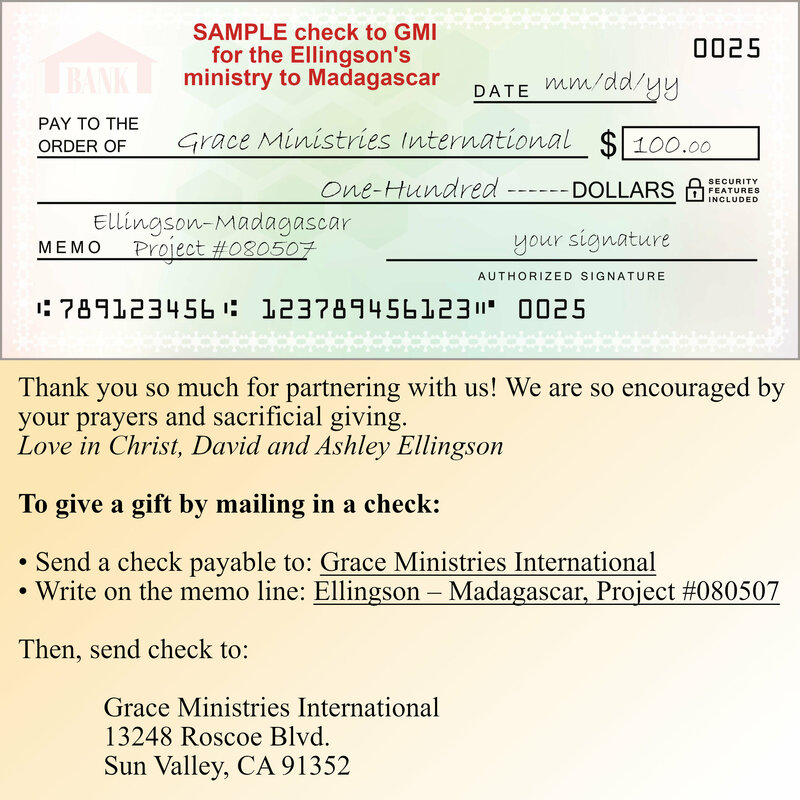 Contact your bank and set up an online monthly payment to “Grace Ministries International“, 13248 Roscoe Blvd, Sun Valley, CA 91352 – be sure to include “Ellingson – Madagascar” in the memo or reference field. Though it’s expensive to send a family to Madagascar for long-term ministry, foreign missions is the means that our wise God has ordained to spread the fame of Christ’s Name through every nation (Matthew 28:18–20). The Lion from the tribe of Judah, the Slain Lamb, is infinitely worthy of the praise of every tribe, tongue, and people (Revelation 5:1–10). May He receive the full reward of His suffering! 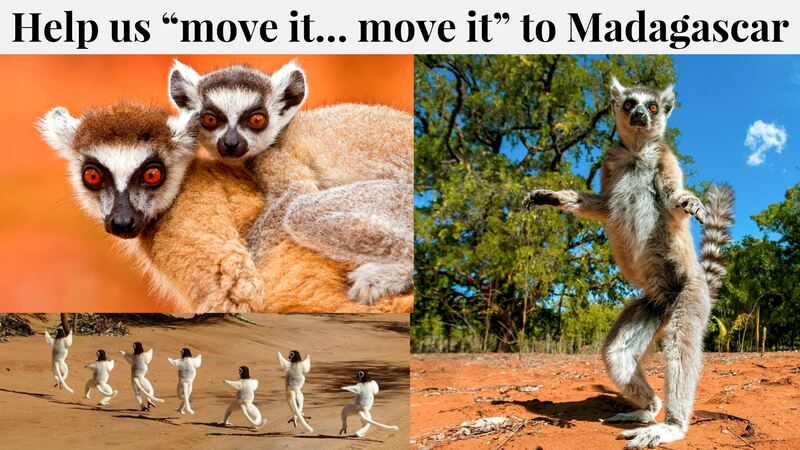 The need to start the work in Madagascar is urgent. Because the churches lack discernment and training, there is a constant threat of false doctrine and false teachers. Believers there are hungry for the truth and are eager for training in sound doctrine. Pray that the Lord will send out laborers into His harvest (Luke 10:2). Thank you joining us in this Gospel ministry!